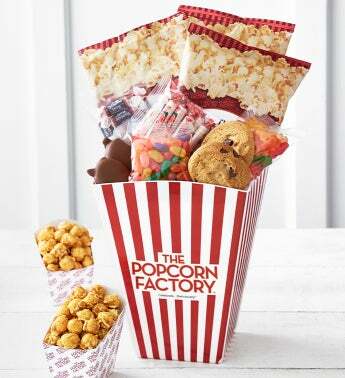 Enjoy the next box office blockbuster with the Big Movie Scoop Snack Assortment's mix of sweet treats and gourmet popcorn. The plastic scoop gift box comes filled with 2 Pixies®, 2 Soft-baked Chocolate Chunk Cookies, Jelly Beans, Gummy Bears, Tootsie Roll Midgees®, Smarties and 3 flavors of popcorn: White Cheddar, S'Mores and Peanut Brittle. Can't pick a genre? Choose our Big Movie Scoop with Cornfusion™ popcorn, which blends our trio of beloved favorites: classic Butter, robust Cheese and secret-recipe Caramel Corn for an award-winning popcorn experience. Serves 2-4.